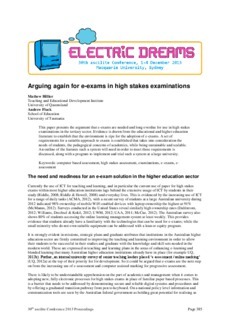 This paper presents the argument that e-exams are needed and long overdue for use in high stakes examinations in the tertiary sector. Evidence is drawn from the educational and higher education literature to establish that the environment is ripe for the adoption of e-exams. A set of requirements for a suitable approach to exams is established that takes into consideration the needs of students, the pedagogical concerns of academics, while being sustainable and scalable. An outline of the features such a system will need in order to meet these requirements is discussed, along with a program to implement and trial such a system at a large university.